We awoke to more wind than anyone would desire to fish in and throughout the day it would blow a steady 40 - 70 kmh. These winds were to continue for the duration of our trip but we were determined to make the best of it. 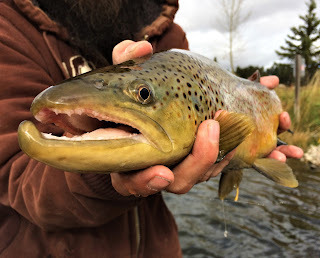 Most spots we tried were a bust in the Duck Mountains and it was down right miserable when fishing out in the open. Luckily the scenery is stellar this time of year and between it and some wildlife sightings it slightly made up for the poor fishing conditions. We finished our day on the same lakes we started at the previous evening with mixed results. My first cast of a faithful spoon produced a rainbow trout over 20 inches in length and near it's adipose fin was a green tag covered in algae with number 087 on it. 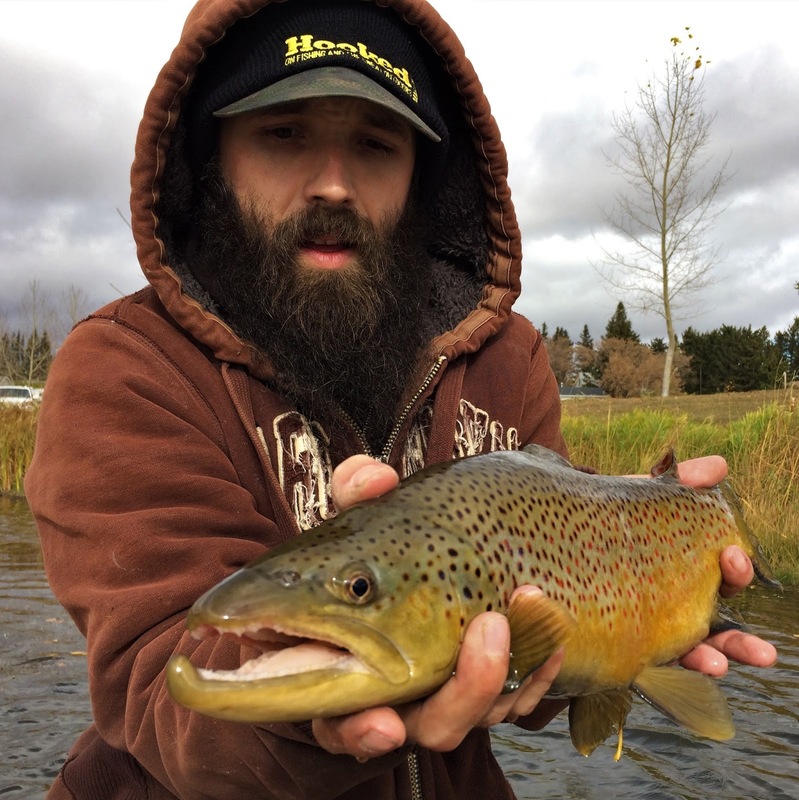 It was one of the "Markosky" rainbows stocked this spring! A different strain than the hatchery rainbows that grow faster and larger than their counterpart. 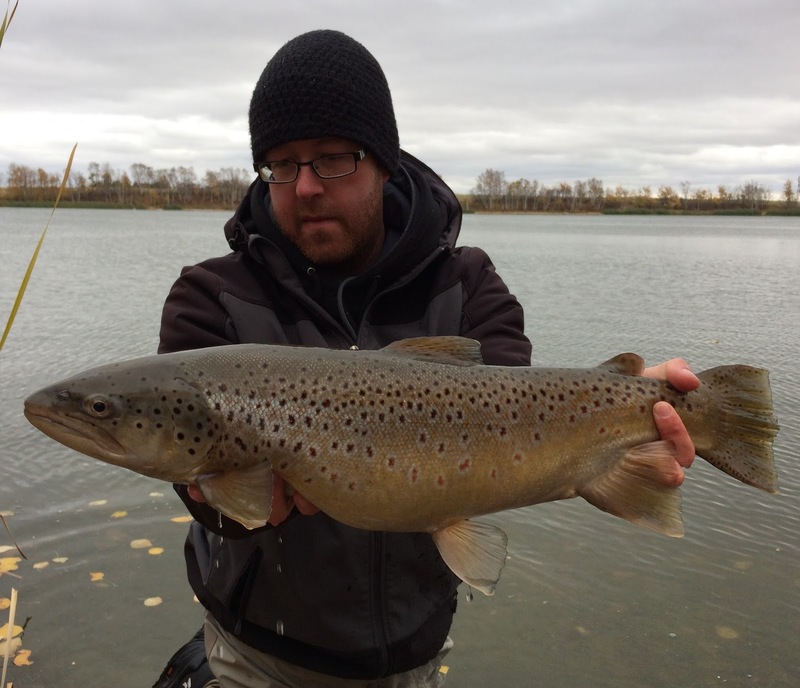 A few browns and bows were landed with a spectacularly coloured male brown trout being a highlight of the trip. Our last full day of fishing was again windy and cold. My wife and I tried a few different lakes in the morning both losing a tiger trout at Twin Lakes and missing a brown trout at another lake near by. She spent the afternoon at the motel, while I met up with a good fishing bud. He proceeded to put on a clinic landing a few browns and rainbows of reputable size, out-fishing me 5-2 with the fly rod. If it wasn't so windy, I had planned for a lesson or two and my first dabble in fly fishing. However the thought of a steady stream of doomed casting attempts in 50 kmh winds didn't appeal to me. I have tons of respect for Justin's skills, knowledge and ability when it comes to fly fishing and can't wait for the time and better conditions to get a lesson or two from him.